Madeira is not really a good birdwatching destination and this brief pre-Christmas break was arranged at the last minute for some winter sun and a complete change of scenery rather than to chase the island's endemic species and "numerous seabirds". Even in December some of the island's flowers remain in bloom and we enjoyed visits to the hilltop Monte Palace Tropical Garden (via cable car), the Palheiro Gardens (also known as Blandy's) and the Botanical Gardens, where we saw numerous species growing wild which would have either been house plants in the UK or confined to a warm greenhouse. From a birding point of view, December is definitely off season. Apart from the day we arrived, when the island had its worst thunderstorms for 20 years, the weather was good, with the south coast and Funchal in particular, being warm and sunny on most days. Once up in the mountains, cloud usually took over and reduced temperatures accordingly. 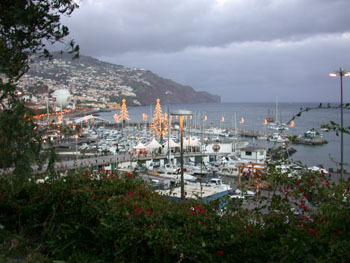 Funchal is a busy, bustling port. 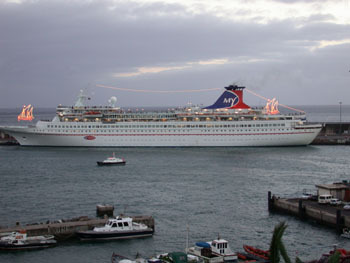 Cruise liners call in almost daily and the Christmas lights beat those in the UK any day. Beware of time share touts in Funchal. Anyone offering you something for nothing, under any pretext whatsoever, is out to introduce you to one of the various hotels/time share operators based in the resort. 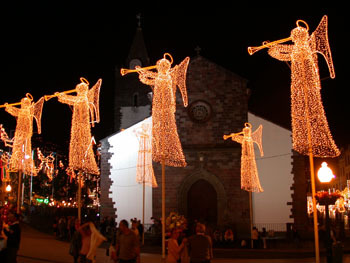 We booked our holiday, 5 weeks prior to our planned departure, via lastminute.com flying from Manchester with Excel Airways and staying at the Villa Ramos hotel in Funchal for the princely sum of £450.38 for half board for two. Although Villa Ramos is a **** hotel the fixtures and fittings are a little tired. It is clean but the rooms appear to require refurbishment. Birding information on Madeira is in short supply. Where to watch Birds in Spain & Portugal by Laurence Rose ISBN 0 600 58404 6 has all of seven pages on the island (three of which relate to other islands in the Madeiran archipeligo).  It does, however, briefly cover the main sites with enough detail to get around. You can also visit the internet and try madeira.seawatching.net or madeirabirds.com where you will find further more up to date information. We also purchased a Globetrotter Travel Guide to Madeira ISBN 1 85974 845 7 which included a Travel Map ISBN 1 85974 847 3 to give us some much needed background information about the island. We hired a car for 5 days at a cost of 110 Euros (£77.61 at the time) and managed to see most of the island, although some of the higher peaks remained in cloud and defeated us. 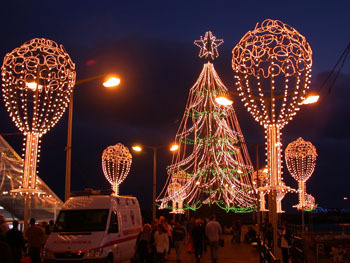 Walking any distance, except in central Funchal and the narrow coastal strip, is only for the very energetic. 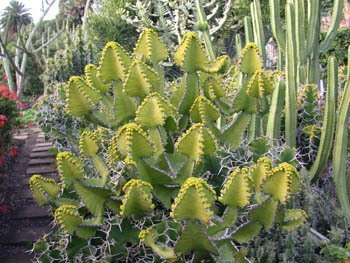 The terrain is generally very steep and difficult under foot, even in the gardens. Distances can be deceptive on Madeira. 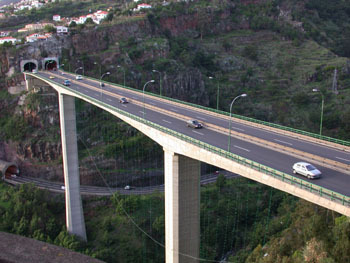 There is now a good motorway link (Expressway R101) along the south coast stretching from Machico, east of the Airport, to Ribeira Brava approx 45kms west. Although the other roads are in the main good, there are innumerable tunnels and, due to the terrain, there are twists, turns and hair-pins at every corner. The roads in the north and centre of the island are the worst with many narrow stretches and major pot-holes not uncommon. There is however an ongoing road improvement program and over time the mountain goat will become outmoded as a means of transport. When planning journeys look at the mileage charts and then add some extra time for the terrain. Restaurante Tokos, Estrada Munumental, 169 9000 Funchal - on the way to the Lido area from the town centre. This is a tiny place where the Maitre d' has a standard patter centered around the fresh fish of the day. The food was definitely the best we had, although prices were 20/30% dearer than the others we tried. Restaurante Combatantes, Rue de Sao Francisco, Funchal - a corner site, set back from the main road, just on the edge of the centre of town. Good selection of fish dishes and friendly service. Restaurante La Rocca, Travessa do Valente, 4 9000 092 Funchal - take right turn up hill at R. Tokos and La Rocca is 100yds on right. A little off the beaten track and therefore misses passing trade. The decor of the restaurant is very modern with massive oil paintings. The staff are young, female and cosmopolitan. The menu is interesting although a bit restricted and we enjoyed our meals there. Our trip list of 28 species tells its own tale. I did however get three lifers (Berthelot's Pipit, Canary and Long-toed or Trocaz Pigeon) and saw Plain Swift once again, having only seen the bird briefly on Tenerife in 1987/88. In addition, the Madeiran forms of Firecrest and Chaffinch are very distinct subspecies, if you are in to that kind of thing. An easy walk from our hotel as it was downhill all the way. I didn't spend hours poring over the large gull flocks around the harbour buildings and boats assuming they were all Yellow-legged, they certainly appeared to be. 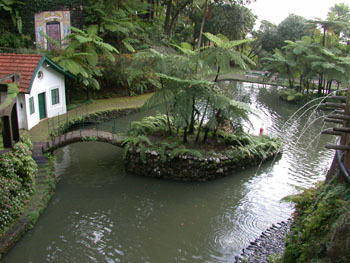 Two streams run through the town and emerge near the Marina in the west and start of the cable car ride in the east, less than 1km apart. What little wader activity we saw occurred here. 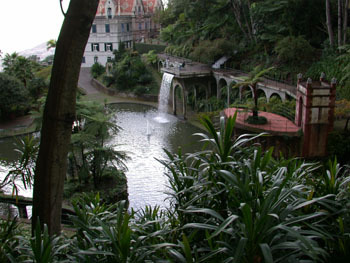 About 20kms east of Funchal by the airport. Rose describes this as "the best sea-watching on the island" where "Cory's Shearwaters pass all day". Not in December 2004! I was looking forward to seeing several different shearwaters and petrels on our trip to Madeira but we didn't see a single one, even miles out to sea and too far to identify, even in this major hot-spot! 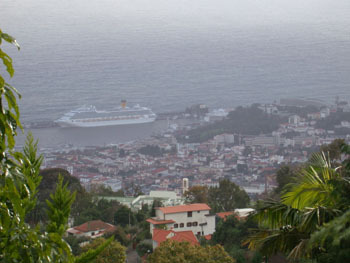 27kms east of Funchal, Machico was the most productive site we found. Keeping to the east bank of the "Riba Machico" (another small stream) follow the road away from the town centre, along the coast, to a pebble beach and harbour area where there is ample parking. The best spot (again) is where the stream runs into the sea. Approx 44kms east of Funchal and beyond Machico and Canical from where a small road runs to a car parking area near the point. There are picnic benches here and a snack vending vehicle but no other facilities. We stopped at Quinta do Lorde where there is a small marina and restaurant. The road runs off to the right and is signed as No Entry (except for the restaurant and marina). Sandwiches are available as well as full restaurant services. We saw 8 plus Berthelot's Pipits whilst walking towards the point from the parking area, literally running around our feet. Approx 56kms west of Funchal at the western-most tip of the island. A little wild and rugged but good for Berthelot's Pipits, Plan Swift, Canaries and Rock Doves. Miles of water out to sea, but still no shearwaters or petrels. There is a small cafe here, Casa de Cha, which serves sandwiches, omelettes and a few main courses as well as cakes and drinks. The cafe is closed on Mondays. 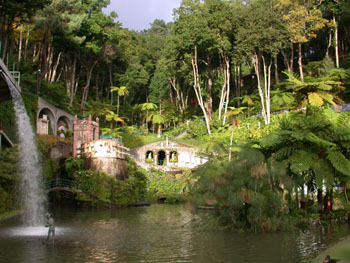 Approx 25kms north of Funchal, this area has the most readily accessible laurel forest on the island. This is however cloud forest and whilst we were there, lived up to its name. As the best chance of seeing the endemic and globally threatened Long-toed (or Trocaz or Madeira Laurel) Pigeon is to overlook as wide an area of the forest canopy as possible, cloud can be a major factor in determining success or otherwise. As the poor bird is so rare, you would have thought that ornithologists would have settled on one name for it by now! The map in Rose's book directs you to the look-out point at Balcoes as this area is said to have one of the densest pigeon populations on the island. On our first trip here we were beaten by the weather and gave up after walking 1km towards Balcoes from Ribeiro Frio in all consuming cloud. The next time we tried, on 18th, the cloud lifted sporadically as we came off the ridge of the island and headed down towards Ribeiro Frio from Funchal. About 1km above the small settlement there is a picnic bench site on the left of the road with a lay-by about a further 20 yards around a bend. We stopped here and looked out over the forest and were rewarded almost immediately as 'hawk-eyed' Amanda spotted two of the pigeons roosting and preening a short way across the valley for the first real scope action of the holiday. The birds subsequently flew around for a short period and a third bird treated us to an overhead fly-by. Approx 66kms north of Funchal via Ribeira Brava and through one of the longest tunnels on the island. The scenery is spectacular but the birding is hardly worth the effort, although we did see our second highest daily total of 18 species on 17th when we ventured north, as a result of returning via Machico where we added at least 8 to our total.